Street markets and elephants, temples and taxi rides – the lush parade of images of Julia M. Becker’s Nonstop India immerses the viewer in the sights and sounds of India. Using real-time footage from a hand-held camera, Becker creates video paintings that layer image upon image, sound upon sound, color upon color, to capture the exuberance, the confusion, the joy, and the chaotic grace of India. Transient moving images – created of light and transmitted through light – dance across the screen/canvas, celebrating the fleeting moments that are our lives on this earth. These transitory images are pure experience; their evanescence denies materialism. There is no object to possess. The viewer enters into the imagery to be seduced by a sense of place. More than a documentation of a journey, Nonstop India recreates a transformative experience. 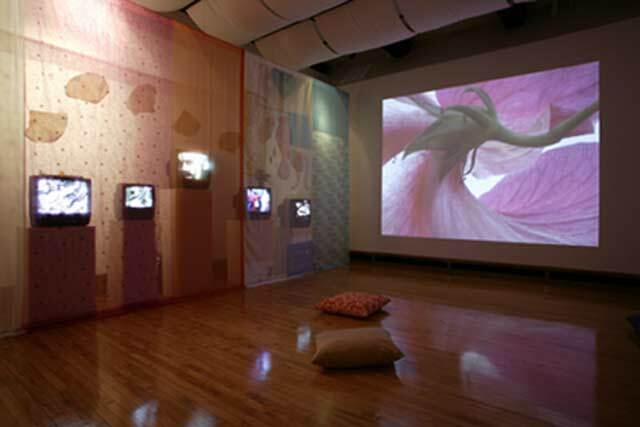 Two stunning installations by Julia M. Becker, Non-Stop India: video paintings and flowebb (hand prints, paintings, sculpture) are currently being exhibited at Paris Gibson Square Museum of Art through October 15, 2005. Both pieces were inspired by the artist’s travels in south India and have evolved into richly layered works that visually and conceptually weave together chaos and grace, spirit over matter, destruction and creation, revelation and concealment, taking the viewer deeper, past the surface of things. Julia is currently Associate Professor of Art at the University of Great Falls. She grew up in Cincinnati and was deeply influenced by her musician grandfather and father and the family activities of studying and making music together. One of seven siblings, she was always encouraged to make art, create music, draw, and to be herself. As a child she was able to freely explore the family’s city and farm homes and environment and grew to love both architecture and nature. Julia’s early formal training included art classes at the Cincinnati Art Museum. As a young woman Julia was influenced and inspired by German Expressionism as she was seeking to move quickly beyond representational imagery in order to tap into a deeper essential nature. She shared with the Expressionists a desire to reveal an emotive rawness, to get at the “truth”, even at the risk of crudeness. Julia pursued science (geology, botany, physics); religious studies(Native American studies, Islam, religion as culture and way of life, sacred imagery and sound); music; creative writing; contemporary and ancient dance; and visual art. She studied drawing with Arthur Helwig; printmaking with Mrs. Shapiro of Edgecliff College;...but primarily created art independently from early childhood on. Julia’s visual art studies continued at Evergreen College in Washington and Montana State University where she received a Master of Fine Arts degree. A few of the many other influences on her work are the Fauves (their interest in animal/nature/spirit), Marc Chagall and Paul Klee (penetration of reality behind visible things, dreams, memory), and Robert Rauschenberg (collage, multiple images). As an artist Julia is interested in “art as action, art as catalyst, art as communication, art as transformation, (versus commodity)...and not necessarily between ‘myself’ and the world but just among humanity.” She is interested in “art as anonymous and mutual act...as much created by you as by ‘me’ (...we are all the same... it is one thing)”. She seeks truth through an intuitive process that changes and evolves and works to uncover the life force, the essential nature of things. The installations Non-Stop India: video paintings and flowebb (hand prints, paintings, sculpture) grew from a suggestion from Jessica Larsen, Curator of Art at Paris Gibson Square, to exhibit work that responded to Julia’s experience in India. This idea merged with the wide range of human/art concerns that drive Julia’s work, the ‘India’ influence being a major energy in the process. Non-Stop India (video paintings) consists of five video screens showing real time footage of travels in south India. The camera was hand held, often in chaotic situations that, when shown together, celebrate the flow of life with the movement of images across the screen/canvas. The images are transient-- a random, fleeting, living moment. Julia’s interest in film and video has to do with its ability to capture time, space, and movement. The viewer enters further into the imagery as footage from one screen at a time is projected large scale onto one of the gallery walls. A sense of participation in the artist’s experience results from this immersion these random moments. Sounds of voices speaking and singing, music, nature, tools striking stone, traffic play simultaneously. All could soon be chaos but for the lovely, pale, diaphanous fabric ‘curtains’ that are suspended in front of the screens and the frieze of lotus leaves that dance around the circumference of the space. Comfortable cushions are provided so that visitors can stay awhile to let the flow of images and sound wash over them. This time element is essential in order to experience the chaos, grace, and exquisite beauty of this work. flowebb is also a reflection of travels in India as well as other events since then – “a continual blending and weaving of ideas, experiences, inclinations, humors, news...”. This installation consists of over 70 painted and hand-printed works on paper, panel paintings, and sculptural groups or ‘altars’ that are seemingly random arrangements of seeds, carved fruit, flowers, clay figures and other bits and pieces of life. These multiple, sequential images are layered so that they read through each other and merge and begin to create new images. They celebrate relationship rather than isolation. The artist states that “in the effort to move away from our inherent materialistic tendencies my working process involves tearing down the methods/techniques/processes/that can obsess us (me) and take us (me)away from drawing deeper, past surface. Breaking it down, tearing through, obliterating, removing, cutting through,... revealing and concealing, wiping off, wiping on, using hands and deliberately awkward tools/materials sometimes... the process of destruction equal to the process of creation”. An image that appears and reappears in flowebb is a tall Bedouin woman. The artist describes her as the axis mundae, the connection from heaven and earth, the Nomadic Goddess with the unlimited potentiality of the Madonna. She is shown in the midst of war, in a destroyed landscape with a hopeful patch of green, in white gauze surrounded by flame. She is always the survivor. As with all of the layered imagery in this work, the animals, plants, cellular states, men and women, architecture, water, gods and goddesses, more questions are raised than answered, as is the artist’s intention. © Copyright 2009 juliambecker.com. All Rights Reserved. All content on this website is property of Julia M. Becker.